Structure: The structure is common to the E200 with local modifications to comply with the E250TC distinctive features. 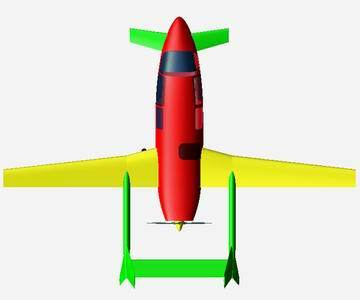 A combination of flaps and lift spoilers, for a better control of very high rate descents, is located in the center wing section aft of the spar, between booms and the fuselage. Accommodation: Dual pilot controls are standard and the enclosed cabin provides deluxe interior finishing and cabin amenities with leather seating for 4-5 persons. The spacious baggage compartment, which is accessible both from the cabin and the exterior, is located in front of the wing spar main bulkhead and behind the rear passenger seats. Systems: An oxygen system is standard. Electrical air climatization (cabin heating and cooling) system is standard. Powerplant: Propulsion is from the single 210HP Teledyne-Continental TSIO-360-H, flat-six, fuel injected, turbocharged engine, driving a three blade, constant-speed, metal propeller with single lever control. The engine maintains its power up to FL080 ISA, providing incomparable cruise performance. Fire extinguisher in the engine bay is standard. De-icing boots are optional. Total fuel capacity: 265 liters (70 US gal).